If you were to ask my children to recount a favorite story about Europe, or to pick the best thing about any one of the amazing cities we visited, they wouldn’t tell you about ancient cathedrals or moats left by the invasion of the Turks. No, they don’t care so much about those. What they will tell you about is the most amazing onslaught of playgrounds since the beginning of mankind. 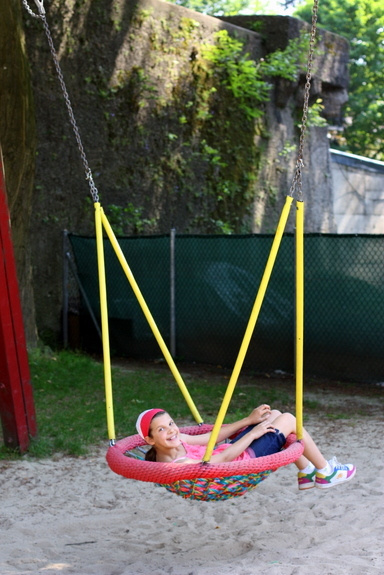 Giant 60-foot metal slides, zip-lines, merry-go-rounds, rope swings, giant 30-foot rope structures for climbing. None of this bark nonsense. Viktor and I were so impressed we launched into story after story, reminiscing our childhoods filled with “real” playgrounds with metal slides, and swings over concrete patches of play yard. I still have bits of pebble embedded in my elbow from a mishap on the swings in the 3rd grade; when I whipped that out to show the children, Viktor pulled up a pant leg to reveal a scar of his own left over from a hot slide in the playgrounds of New Orleans or L.A.
We had a lot of conversations with the children about the state of play in America. We reminded them over and over and over again how lucky they are to have a big yard with a swing set, to be able to roam free in our safe neighborhood. 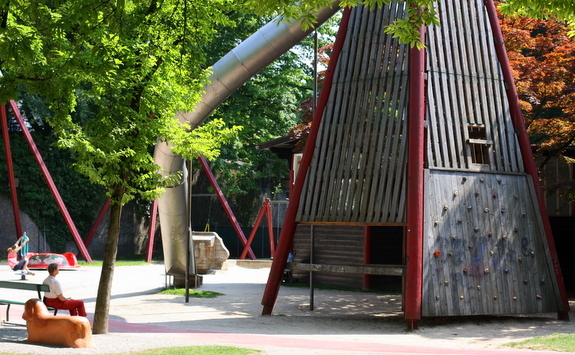 How lucky they are to have played on 60-foot metal slides in Salzburg, and a zip-line in Prague. We talked to them endlessly about children who have no play structures at all, who have nowhere safe to play. And of course, we discussed the reason playgrounds in America have become so “safe”. We’ve become a land of so many lawsuits, there’s little room for common sense and natural parental intervention. We were so relieved to find that somewhere in the world children are still playing on playgrounds the way they were meant to be. Some of my favorite memories from childhood include wearing gym shorts under my dresses at recess, so I could climb up my favorite light-green metal structure and hang upside down. This thing was a relic. By the time you got to the top it would sway back and forth easily. There was no plastic, no bark, no rubber. Just metal and sand and happy kids climbing like monkeys. By the time I left elementary school (1996) the old metal equipment had been replaced with lots of plastic. To my knowledge, my elementary school still has swings. I guess I’ll just have to move to Europe when I get pregnant. I want my kids to be kids. That means skinned knees, scratches, bruises and bumps. Kids should be able to play without adults worrying about lawsuit liability. Your playground pictures look awesome! The swings were removed from my children’s elementary school because a kid broke his arm 5 years ago. Seriously? I think that’s silly. Man, I considered it a required part of growing up to get burns from hot metal slides, splinters from wooden playground equipment, and semi-permanent pebble indentations from face-planting into the ground during a heated game of tag. I don’t get these super-padded seamless plastic nerf playgrounds that kids get nowadays! Right? Or on a super cold day when the metal slide was freezing? Man, I miss those days. The playground thing is the beginning of taking away common sense in America. Instead of taking personal responsibility and solving problems, everyone’s blaming someone else and asking for legal parameters to replace sense. Me? I watch out for my kids but let them take risks and get hurt a little. I want them to be comfortable outside and know that their minds and bodies can always stretch more. 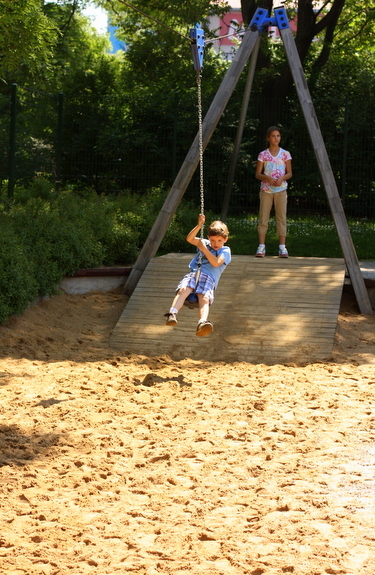 Your playground pics look so fun! What a great experience for your kiddos. I completely agree. I think if they’re in a little bit of bubble wrap, the consequences of daily life are negated. 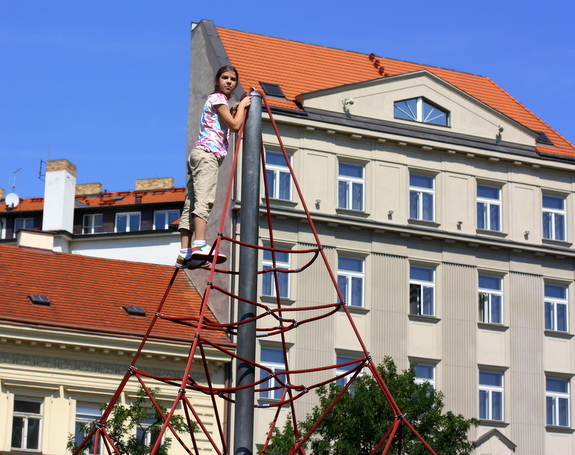 The playground experience broadens to every other part of their lives too. The playgrounds were AMAZING. I miss them. I love this post! I have really enjoyed reading your thoughts about Europe. I am American and have been living overseas in Europe for almost 10 years with my EU husband. We have 2 boys- 4 and 14 months. We are thinking about moving back to the US in the next few years but to be honest, the ‘state of play’ or ‘state of being allowed to be a kid’ in the US is something that concerns me. The playground pictures you post from your trip are representative of the playgrounds where we live, too. They are absolutely unbelievable. 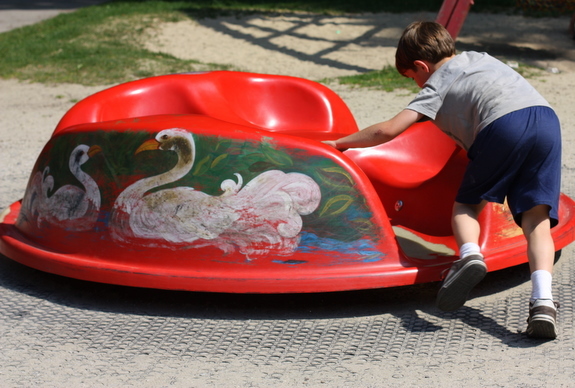 I am used to them now, and whenever we travel to the US for visits, I am positively struck dumb by the playgrounds, the helicopter parenting and the obsession with safety. When I was growing up in the 70’s (in the US), playgrounds were like a free for all and (shock!) we got hurt now and again!!! I love the US so much, but overall I question whether or not we would be robbing our kids of a more carefree existence if we leave the country where we are. I *do* notice the difference- well, it’s my opinion: Kids in Europe stay innocent a bit longer, they are not obsessed with ‘getting hurt’ (or war games for that matter), and parents are not constantly worrying about who is going to sue who…Also, at playgrounds where we are there is an overall feeling of community responsibility for the well being of all children- not just ‘your own’. Gosh, I could go on and on. Your kids are so lucky to have parents with the perspective you do! Man, I would stay put. I seriously am trying every day to figure out a way for us to move to Europe, at least temporarily. It was funny, being in Europe, I didn’t love the everyone else bossing my kids, but maybe it’s because I’m unused to the flip side of it, where everyone takes care of your kids too. I’m in love with Europe. I’d stay if I were you. That’s how I feel about it Kelsey. I think the bubble of helicopter parenting does more harm than good. common sense and natural parental intervention…. seriously, what happened to these? Why is it always someone elses fault? I wanted to play in and around all of them. I was too tired from all the walking walking walking to do it, but now I wish I had. And yes, so so so sad about the swings being banned. My kids are missing something. I highly recommend checking out Lenore Skenazy (http://freerangekids.wordpress.com/). I heard her called “The Worst Mom in America” in a piece on NPR (they didn’t call her that – they were talking about the backlash from an article she wrote) and I had to check it out for myself. I agree with 95-99% of what she has to say about raising kids and it’s been a huge source of validation for me that she’s willing to talk about raising kids without hovering over them and sucking ALL THE JOY out of their existence. I love reading about her! I’m probably more a free range parent than I like to believe. Thanks for the link.